Filipino American History Month, also known as Filipino American Heritage Month, is celebrated in America in October. Various community leaders, advocates and their respective organizations schedule events and awards ceremonies to recognize the history, heritage and accomplishments of organizations and individuals who have contributed to the betterment of the Filipino-American community. One special awards event dominates the social media mid-summer, sometime in July, when nominees are announced on Facebook. By October, when every family, friends and colleagues have voted, everyone's newsfeed is flooded with the photo-profile of each outstanding nominee. 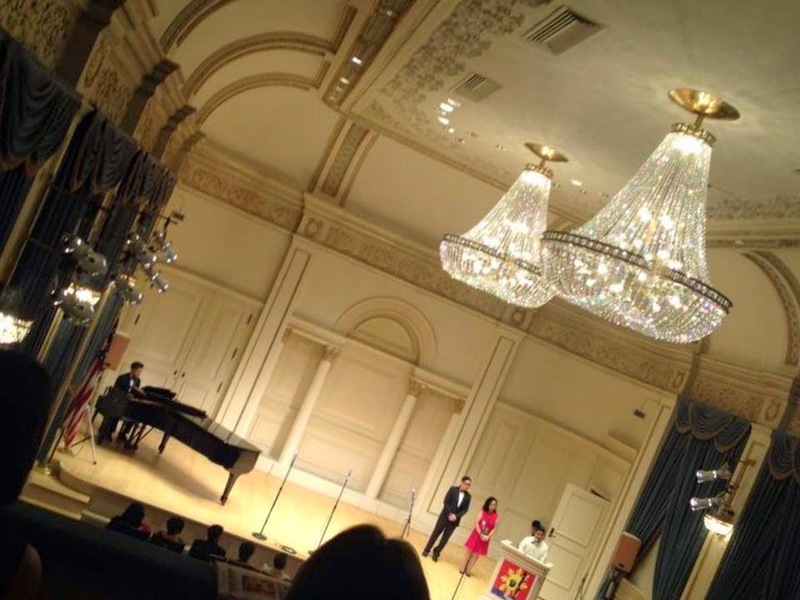 Such event is the "The Outstanding Filipino Americans in New York (TOFANY)" - an awards ceremony held at Carnegie Hall. "How do you get to Carnegie Hall? Practice!" The individuals and organizations recognized at TOFANY have practiced compassion, dedication, perseverance and courage. They are those who dared to dream, took risks and did what was necessary to help other people. On October 25th, 57th and 7th Avenue were overflowing with pride from the Filipino-American community. Men, women and children were standing tall in their formal attire, happiness filled the air and laughter were shared by many. Hours before doors opened, the lobby was populated by eager members of the community. The Titas (aunties) were busy putting together the corsages, ushered the guests of honor to the reception area, and made sure that everyone's attended to. In the waiting room, TOFANY alums shared stories and smiled for photographs. Backstage, the performers were preoccupied with last minute rehearsals and wardrobe inventory. In a black t-shirt and black pants, one Filipino was moving like a bumble bee jumping from one task to another: getting last minute preparations, confirming reserved tickets, calmly adhering to the numerous strict rules and regulations of Carnegie Hall , and taking time to acknowledge every person waiting in line. The dark circles under his eyes were evident that he had not had a decent sleep in a long time. However, by 8 P.M. when everyone was finally seated in their respective spots, absorbed the elegance of the ambience inside Carnegie Hall ( Weill Recital Hall) , felt the sense of pride and overwhelmed by the camaraderie, all eyes were focused on that Filipino who had changed his wardrobe from t-shirt to the traditional embroidered formal shirt we call "Barong Tagalog". That man is Mr. Elton Lugay, the Founder and Executive Producer of "TOFANY". As I was watching him from the balcony, I couldn't help but acknowledge that that man Elton had the chutzpah in organizing such magical and magnificent evening. Planning and actually making this event is a feat of immense work, focus , determination, teamwork and leadership. The host for the evening was Maria Ressa, the CEO of Rappler. She had such a soothing voice that it helped calm the nerves of the honorees who had to go up the stage and deliver their 60 second thank you speeches. The evening's honorees delivered heartfelt gratitude and asked for continued support and understanding. The speakers inspired and challenged the community to do more, break the barrier and create more leaders. One speaker's message hit home. Major General Antonio Taguba, a retired United States Army, reminded the audience to "Start the conversation early. Caregiving is a family matter. However, we don't talk about it. As Filipinos, we are a close-knit family and a tight-lip family!" He also emphasized that "Caregiving can be a debilitating and extraneous experience for everybody -- and it can be a financial burden." 1) Do I have enough life insurance to cover debts, medical bills, or funeral services? 2) Do I have a living will? 3) Who can I trust to make decisions on my behalf? 4) Who will act as guardians to my children? 5) Does anyone in my family know where I keep the financial and legal documents? The performers received a standing ovation. One performance touched my heart as it reminded me of my father when the Philippine Chambers Singers of Los Angeles sang one of my father's favorite songs, "Dahil Sa Iyo." And as I was wiping my tears, I noticed I wasn't alone. The people in the balcony were holding on to their hearts as they held the hands of their loved ones seated next to theirs. By the end of the night, I was homesick but at the same time inspired to do more, and eager to see what the TOFANY Board has in-store for us in their 5th year celebration in 2015! Congratulations, Thank You and Mabuhay! This year’s Heritage Awardees are award-winning songwriter Bobby Lopez, fashion designer and philanthropist Josie Natori; Dean of Academic Affairs at Columbia University Sheila Coronel; the founder of Fiesta In America trade and cultural expo; and the medical mission volunteers of Philippine Medical Association in America (PMAA). Pilipino American Cultural Arts Society - Washington, D.C. This year's speakers: (Keynote) Consul General Mario de Leon, Jr. , Ms. Loida Nicolas-Lewis, Major General Antonio Taguba, Senior Advisor Jason Tengco, and Miss USA 2014 1st Runner-up Audra Mari.